NAR Apostles: Patricia King and Lou Engle. Home › Extreme Prophetic (XP Media) › NAR Apostles: Patricia King and Lou Engle. 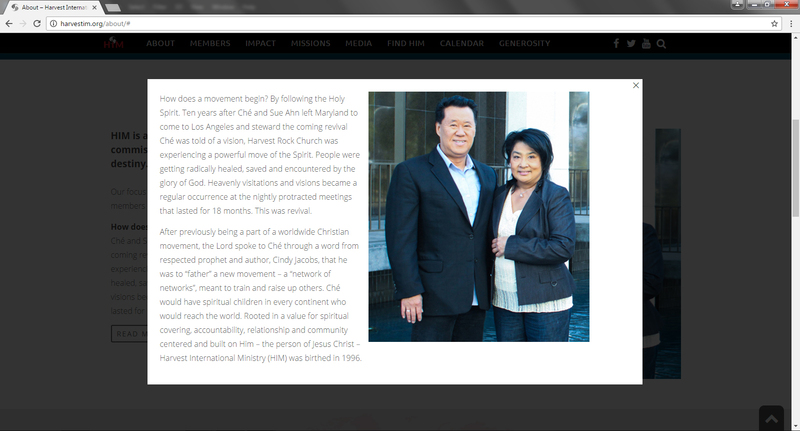 In case you are not aware, Che Ahn of Harvest International Ministries has declared Patricia King and Lou Engle to be New Apostolic Reformation (NAR) Apostles. Jesus’ Apostles commended Christians (as Paul did with the Bereans) for testing their message and teachings. In contrast, NAR Apostles think they are above having their teaching scrutinized. They do not like to have their teachings, visions, prophecies or special revelations biblically challenged. In fact, they do not tolerate anyone who does. These NARpostles are abusive, controlling, deceitful, lawless, hostile, and sometimes even appear ‘deranged’ (and that’s being polite). These NARpostles blatantly lie about their titles and justify any form of immoral, unethical and sometimes lawless behaviour to advance their own ministries. And finally they operate like a pack of wolves. They defend one another and go after the sheep or shepherds who try to warn God’s flock of their schemes. This is why we call NAR Apostles NARpostles, their idea or concept of an apostle no way resembles actual biblical apostles. 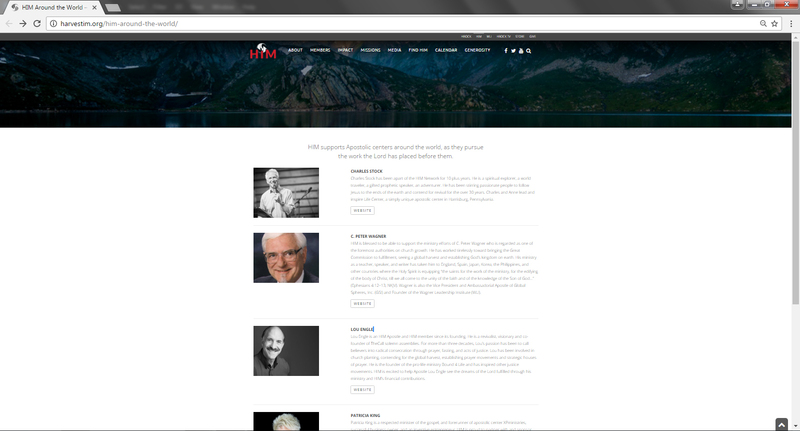 We hope you take advantage of this resource as we point out who some of these NAR Apostles are. “How does a movement begin? By following the Holy Spirit. Ten years after Ché and Sue Ahn left Maryland to come to Los Angeles and steward the coming revival Ché was told of a vision, Harvest Rock Church was experiencing a powerful move of the Spirit. People were getting radically healed, saved and encountered by the glory of God. Heavenly visitations and visions became a regular occurrence at the nightly protracted meetings that lasted for 18 months. This was revival. Source: Our Movement Birthed, HarvestIM.Org, http://harvestim.org/about/#, Access 13/05/2017. This is important in light of the information given by Che Ahn who said of Lou Engle below that, “Lou Engle is an HIM Apostle and HIM member since its founding.” This means Lou Engle has been an NARpostle since 1996. This also means that when Michael Brown was working with both Che Ahn, C. Peter Wagner and Lou Engle, he chose to surround himself and work with NAR Apostles. pursue the work the Lord has placed before them. Charles Stock has been apart of the HIM Network for 10 plus years. He is a spiritual explorer, a world traveler, a gifted prophetic speaker, an adventurer. He has been stirring passionate people to follow Jesus to the ends of the earth and contend for revival for the over 30 years. Charles and Anne lead and inspire Life Center, a simply unique apostolic center in Harrisburg, Pennsylvania. HIM is blessed to be able to support the ministry efforts of C. Peter Wagner who is regarded as one of the foremost authorities on church growth. He has worked tirelessly toward bringing the Great Commission to fulfillment, seeing a global harvest and establishing God’s kingdom on earth. His ministry as a teacher, speaker, and writer has taken him to England, Spain, Japan, Korea, the Philippines, and other countries where the Holy Spirit is equipping “the saints for the work of the ministry, for the edifying of the body of Christ, till we all come to the unity of the faith and of the knowledge of the Son of God…” (Ephesians 4:12–13, NKJV). Wagner is also the Vice President and Ambassadorial Apostle of Global Spheres, Inc. (GSI) and Founder of the Wagner Leadership Institute (WLI). Lou Engle is an HIM Apostle and HIM member since its founding. He is a revivalist, visionary and co-founder of TheCall solemn assemblies. For more than three decades, Lou’s passion has been to call believers into radical consecration through prayer, fasting, and acts of justice. Lou has been involved in church planting, contending for the global harvest, establishing prayer movements and strategic houses of prayer. He is the founder of the pro-life ministry Bound 4 Life and has inspired other justice movements. HIM is excited to help Apostle Lou Engle see the dreams of the Lord fulfilled through his ministry and HIM’s financial contributions. Patricia King is a respected minister of the gospel, and forerunner of apostolic center XPministries, successful business owner, and an inventive entrepreneur. HIM is proud to partner with and sponsor such a mover and shaker in the Kingdom of God. She is an accomplished itinerant speaker, author, television host, media producer, and ministry network overseer who has given her life fully to Jesus Christ and to His Kingdom’s advancement in the earth. She is the founder of XP Ministries and co-founder of XPmedia.com. Source: HarvestIM.Org, hhttp://harvestim.org/him-around-the-world/, Accessed 12/04/2017. ‹ Furtick Keeps Demonstrating He is Unqualified.